Safe rooms were evaluated by McDonald-Mehta Engineering, LLP to structurally bear the wind load of a 250 mph tornado. McDonald-Mehta Engineering are the #1 wind engineering scientists in the world and have been selected by the National Weather Service to develop the new Enhanced Fujita (EF) Scale, which rates the tornado strength categories. Door openings are 32" or 36" depending on size and weigh 250 lbs for maximum protection. Our doors open inward to prevent entrapment. The removable air vent deflector covers keep out flying debris and are easily removed to allow quick access to the inside door latches. The three 1" steel door pins/locks hold the door securely shut. Each of the three hinges has a removable pin for easy door removal. Three-fourths inch Redhead wedge anchor bolts are set 13" apart. 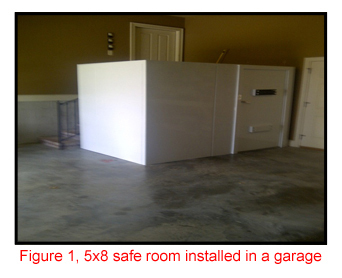 All safe rooms are built to meet and exceed all standards set by FEMA, the NSSA and the ICC 500 building council. Custom sizes are available and we can make ceiling heights on custom builds up to 8 ft tall for an additional 10% of SF price.